For one week in August I had the chance to co-lead summer camp with the Centre’s Camp Leader, Kennedy! 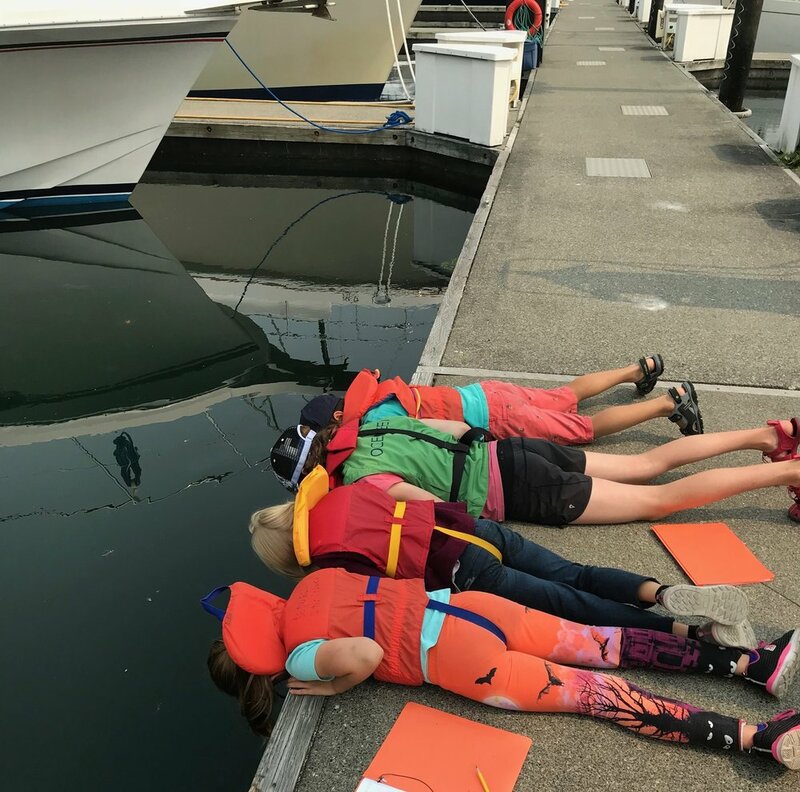 During Salish Sea School, kids ages 7-11 explore beaches, cruise on boats, create marine-themed crafts and play games. To say I had fun is an understatement. It was such a lovely group of campers who were all eager to learn and explore. In an earlier blog post about my experience facilitating school programs, I mentioned the importance of staying on your toes while teaching kids. Camp—which takes place primarily outside—takes this to the extreme. You never know how a group of campers will interact with each other or the environments we venture into. Kennedy informed me each week of summer camp so far has been a wildly different experience, so ‘going with the flow’ is a necessity. Unlike school groups, where we engage students for an hour, campers are in our care for five days. It was really nice to get to know each camper and watch them bond with each other as the week went by. On the first day, the campers spent the morning exploring the aquarium, playing games and getting to know each other. By the afternoon we headed to the marina for our ‘dock walk’, where we got the chance to peer over the edges of the docks and look for critters. It was exciting to witness their joy and cool discoveries. I too was excited by cool discoveries! 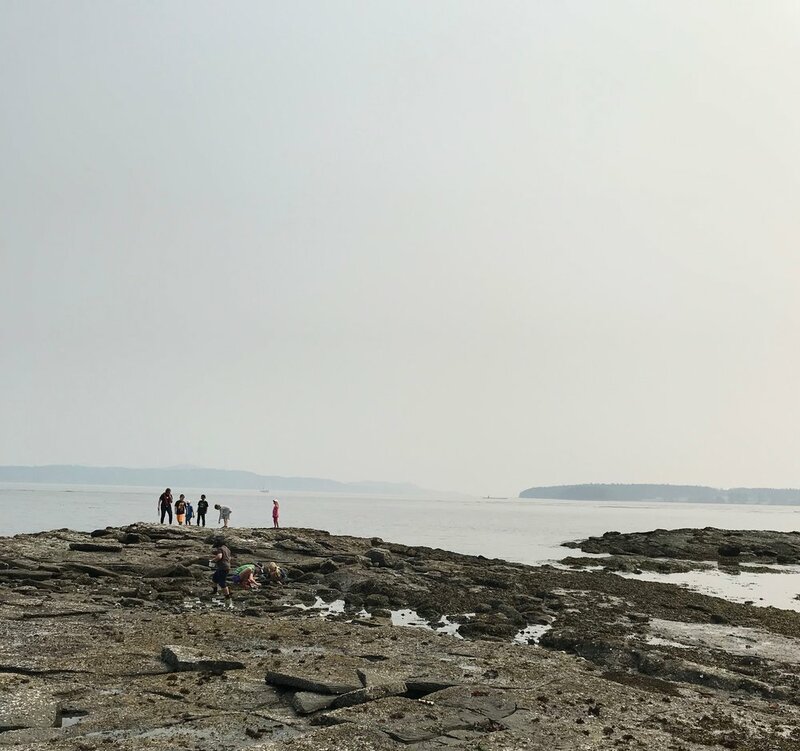 Over the next few days, campers experienced crafts, beach walks, a squid dissection, and a trip to Portland Island in our nearby National Park, Gulf Islands National Park Reserve! They even explored ‘behind the scenes’ at the aquarium and learned about the job of an Aquarist! We ended off the week by spending a day on Sidney Spit. For me this was definitely a highlight. The day was full of play, creativity and exploration. We built sandcastles, caught flatfish, played ‘princesses’ and learned about jellyfish. What started as a group of shy kids on Monday, turned into a very silly, extroverted group by Friday. There were new friends made and new creatures discovered. It was rewarding to be a part of their week. Summer camp critter finds: lion's mane jelly, sea hare, sea lemon, sea squirt. To wrap up the summer, I want to share some of my top biology WOW moments from working at the Shaw Centre for the Salish Sea. Overall, this has been an amazing summer co-op term! When I first applied for this job I had no idea what working here was going to be like. I never expected to meet so many amazing and inspiring people. From my coworkers, to the volunteers and aquarium guests. The centre has allowed me to grow so much in just 4 months. I feel confident in my ability to communicate science to a variety of audiences and confident in myself as a soon-to-be biologist. I can’t begin to express how thankful I am for all that the centre has done for me. Looking back at all the experiences I have had over the summer, I see how lucky I am to have been here. Amendment: We are delighted to announce Rachel will be staying on with us part-time.